Playing card games is the perfect way to get the fun started at your next party. Aaron Gessner is the creator of the party card game Celebrity the Game. Aaron Gessner (AG): After I graduated from college with a degree in theater, I immediately moved to New York City. I was a professional theater performer throughout my 20s. I'm a ballroom dancing instructor and an aspiring guitarist/rock performer. I'm also a writer and published poet. Currently, I live in Chicago with my talented and amazing wife, rock star dog and perfectly average cat. In my "day job" I work as a publicist at a PR firm. I've always loved to hear and tell stories in all of their manifestations and find this career is a good fit for that passion. LTK: What inspired you to create card games? AG: Celebrity came about from my acting career. I'm a game junkie, and everywhere I travelled, performers knew the game so it was a great ice-breaker when I got a role and found myself with a new group. It was a way for us to act out names of actors, memorize their names and learn why they were famous. It was also a blast to play! When I would return home to Chicago for the holidays I taught my family how to play Celebrity and they fell in love with it. These were lawyers, veterinarians, manufacturers, accountants, executives, teenagers; and they all were crazy about playing it! We started to incorporate different categories such as Historical Personality/Newsmaker, Famous Animal/Cartoon Character, Sports Star, Author/Literary Character and Famous Musician/Band instead of simply actors to make it more appealing to a wide range of players. It took me a while to come to the decision to copyright the game and make it into a product. What drove me to do it was the fact that it appealed to everyone who played it, was so much fun, was educational, and nobody had ever done it before. LTK: What is unique about Celebrity the Game? AG: Is Celebrity unique? The game itself is a combination of old parlor games that people have been playing forever. It is The $10,000 Pyramid, meets Memory mixed with Charades. When Moon Unit Zappa reviewed it for Jane magazine she described Celebrity as "Charades on Crack", ha! The combination of these three rounds makes the game fast-paced and engagingly addictive. What I think is unique about Celebrity is that the players come up with and write down the names used on the cards, so every time you play it is new and geared specifically to the group playing it. We have friends in DC that do a Capitol Hill version, teachers that use it in the classroom as an educational tool, and pals in other countries that play it in their own language, specific to their culture and "celebrity" names. We also wanted to make sure that the game was recyclable and of the highest quality. So many games today are made of the cheapest materials to keep costs down. We found the highest quality products and tried to manufacture and package in the United States whenever possible. All of the playing cards and scorecards are 10-point laminate, and the china markers make the cards erasable so they last a lifetime. We use an electronic timer so players can hear when their time is up rather than having to keep looking at a sand timer. Our games were packaged by Lambs Farm, a premier non-profit organization serving people with developmental disabilities. It means a lot to me personally to know that each game was packaged and handled with care by these inspirational people. LTK: What ages can play your game? AG: I'd say six and up, but I've found precocious children that have been able to play it at age four. LTK: How is the game played? AG: The cards are dealt (five to seven per player), each player writes down the name of a famous celebrity (without telling anyone what she wrote) that corresponds to the category on her cards. The cards are shuffled together, and the players split into two teams (up to 16 people can play!). The cards are placed into a grab bag, and the teams go back and forth with one-minute turns (on an electronic timer) trying to get their teammates to guess the names without ever saying the name of the celebrity. When a name is guessed correctly, it is taken out of the grab bag. You can say what movie he was in, what book he wrote, who he married, then divorced, then married again…you get the idea. There are three rounds of guessing. The first round you can "say anything" about the celebrity except the name of the celebrity, second round only "two words" as a clue, and the third round is "no words", only charades. A round doesn't end until all the names have been guessed correctly. 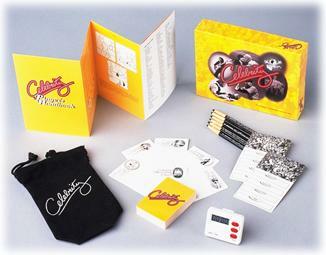 Celebrity is so fun for the entire family because the celebrity names used in the game are created by the players (there is also a players' handbook with more than 1500 suggested names if you need it) and the cards are erasable and reusable so that every time you play, you play with names that your group knows, and the game can change with the times as new celebrities enter into the public consciousness. I've seen families who think they know so much about each other play Celebrity and learn new things; discover what books their children, parents and grandparents are reading, bands they are listening to, news they read, shows they watch, what they think is "celebrity", names that are meaningful to their everyday experience and why. This speaks to the inner-teacher and nerd in me and over time has become the biggest thrill I derive from the game. Also, you don't have to sit around a circle or need a table to play. Celebrity can be played at the beach or on a camping trip as easily as it can be played at a picnic table or in the family den. LTK: Where can our readers purchase this game? LTK: Do you have any other information you'd like to share with our readers? AG: If you love board games you are probably someone I want to know. I believe that play, dance/music, and travel can keep you young for the rest of your life. Be competitive when playing but don't mistake competition for being a bully, gloating when you win or being a bad sport when you lose. Every game you play is an opportunity to learn, create fellowship and forge lasting memories.